I really loved this article and so I’m just going to link to it here. If you’re an aspiring designer, then heed this advice. I have found myself giving all of this feedback time and time again. It’s all great advice that I strongly support. There is one caveat – if you are making a war game, then it is expected that there will be some player elimination. On the whole though, I’d recommend avoiding player elimination! The Number 1 Up and Coming Game? Using some high tech math (division! ), a user on boardgamegeek.com has figured out what the top 50 up and coming games are for February 2014, and guess what came out on top? This Town Ain’t Big Enough for the 2-4 of Us is number 1! Basically he took the ratio of new owners to existing owners to come up with a number and This Town Ain’t Big Enough for the 2-4 of Us had a ratio of 14.43, compared to the next highest which was Android: Netrunner – Fear and Loathing which had 13.92. 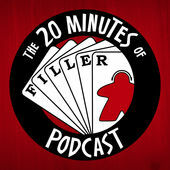 20 Minutes of Filler Podcast just did a podcast where they talked a bit about Kickstarted microgames, followed by a review of a great game called 6 Nimmt and finishing with a wonderful review of This Town Ain’t Big Enough for the 2-4 of Us! Check out the entire podcast here. Jump to 17:20 to get right to the review for This Town Ain’t Big Enough for the 2-4 of Us!